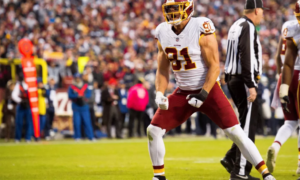 When you analyze this past Sunday’s game, I guess it all depends on how you look at the Redskins after the 21-9 loss to the Indianapolis Colts in front of let’s say a crowd of…people. If you look at it with rose colored glasses, it appears that the team merely suffered a tiny setback in its eventual dominance of future opponents. You can wave it off and even very astutely quote the Black Knight from Monty Python’s The Holy Grail and exclaim: ” Tis but a scratch!” And as you left what you considered a pretty full FedEx Field, you probably stopped by the ticket office and put a security deposit on those playoff tickets. You know it’s early in the season and this sort of set back happens to all the great teams. The positive fan sees this loss as a big nothing burger and that QB Alex Smith is just getting his timing down with his arsenal of weapons. TE Jordan Reed is just breaking off some residual rust. Maybe RB Adrian Peterson just decide to be “Half Day” instead of “All Day” because Peterson knew the offensive line was just out of sync on Sunday and still is one of the best lines in the NFL regardless of this game’s outcome. Even the positive fan looks at the Redskins defense and sees gains with two turnovers and some 3 and outs throughout the game. 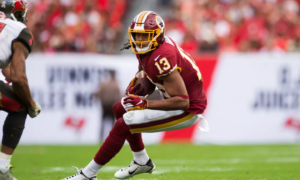 The negative fan looks at WR Josh Doctson’s output and wonders if he’s another in a long line of Redskins WR draft busts that have failed the team. They also look at the other wideouts and wonder if they are all collectively a weak number 2 WR at best. None of the wideouts seem to be a game changer and Smith clearly doesn’t trust them because he’s too busy checking down to TEs and RBs because it takes too long to develop the long game. The negative fan also places blame on Jay Gruden for once again ditching the run because the offensive line stunk it up like an obese fan, after eating mediocre pit beef bbq sandwiches and chili fries, in the half empty bathrooms at FedEx Field. 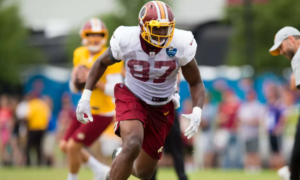 The positive fan says the problems the Redskins have are correctable and that sometimes a team like the Colts who were 0-1 entering the game just wanted it more than the Redskins. Maybe the Redskins could afford to lose a game or two to a non-conference foe. Who cares? Its a loss that doesn’t really hurt the team. The negative fan ponders what they would do if they didn’t waste their time watching the game and could possibly do some yard work instead? Maybe even pick up another hobby? Such as trolling current positive fans? Something involving masochism maybe? They have 26 years of experience, as they have watched this once proud franchise be run into the ground and treated like The Gimp in Pulp Fiction. The positive fan says its more fun to cheer than to boo. The negative fan feels like its their duty to tell the team through boos and cursing that they are playing poorly against a mediocre Colts team that they should have beaten. The positive fan thinks all will be well if the Redskins can beat a powerful Green Bay Packers team at home next Sunday. 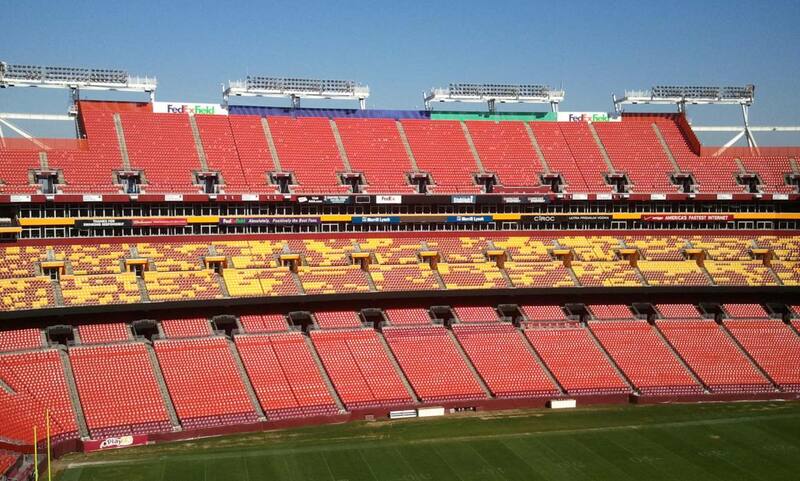 A negative fan can picture FedEx Field half full of Redskins fans and the other half full of Packers fans. Both types of fans can agree on one thing, it’s a long season and if the beer glass is half full or half empty, regardless who shows up to the stadium, both will have to drink just to keep it interesting.